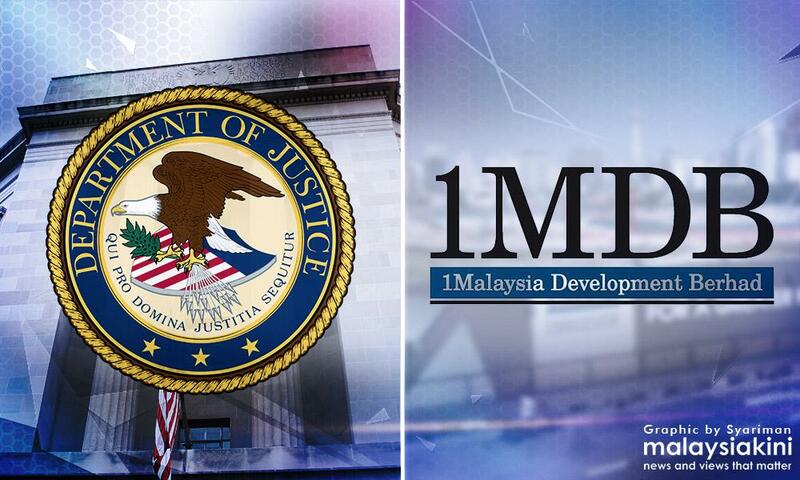 The US Department of Justice (DOJ), in its third and newest asset seizure filing announced last night, revealed a previously undisclosed phase in which more of 1MDB funds were allegedly siphoned. The 251-page filing described this fourth part as the "Options Buyback" phase in which US$850 million was siphoned from two loans totalling US$1.225 billion. 1MDB, through its subsidiary 1MDB Energy Holdings Limited, had taken the US$250 million and US$975 million loans from Deutsche Bank. This money, like in previous phases, was partially used for the benefit of certain individuals including executives of 1MDB and Aabar Investments PJS as well Malaysian officials and their relatives. However, a key difference, was that a significant sum was also used to "cover the hole" in 1MDB's subsidiary Brazen Sky Limited, which claimed to have US$2.318 billion worth of "fund units" in Bridge Global Absolute Return Fund (Bridge Global Fund), managed by Bridge Partners Investment Management Limited, but the DOJ said is "relatively worthless". This was achieved by recycling the Deutsche Bank loan through a network of transactions that made it appear as if Brazen Sky was progressively redeeming the fund units for cash when they were, in fact, the same money going in circles. Before delving into the elaborate and complex scheme in the cover-up of the fund units, it should be noted that the first DOJ filing had outlined three other phases in which 1MDB's funds were allegedly siphoned. One of this was the Good Star phase where 1MDB had invested US$1.83 billion in a bogus joint-venture with PetroSaudi International and US$1.03 billion of this money was allegedly siphoned to Penang billionaire Jho Low's Good Star Limited. 1MDB later declared it had sold the investment and received US$2.318 billion in shares, which included a handsome US$488 million profit on its original investment. It then invested the sum in "fund units" managed by Bridge Partners Investment Management Limited. In reality, the "fund units" cannot be worth US$2.318 billion as at least US$1.03 billion had been siphoned and the additional US$488 million profit also did not exist, leaving the fund units being worth no more than US$800 million, if not less or any at all. So then how did 1MDB chief executive officer Arul Kanda Kandasamy, in a statement on Oct 12, 2015, announce that 1MDB had redeemed US$1.39 million of the US$2.3 billion "fund units" held by Brazen Sky Limited? According to The DOJ, it started on Sept 5, 2014, when 1MDB drew down US$223 million out of the US$975 million loan from Deustche Bank. 1MDB misrepresented to Deutsche Bank that the loan was intended to buy back share options from Aabar Investments PJS, a subsidiary of Abu Dhabi's International Petroleum Investment Company (IPIC). The money was then disbursed to Aabar Investments PJS Limited (Seychelles) (Aabar-Seychelles), a company owned by rogue Aabar official and Jho Low's associate Mohamed Ahmed Badawy Al-Husseiny, but was made to appear like the subsidiary of IPIC. Aabar-Seychelles then transferred US$111 million to Lambasa Global Opportunity Fund which then passed US$110 million to Bridge Global Fund. On Sept 11, 2014, Bridge Global Fund then transferred the US$110 million to Brazen Sky, which was framed as a "redemption" but ultimately originated from 1MDB's Deustche Bank loan. A day later, Brazen Sky transferred US$94 million of the money to 1MDB Global Investments Limited, another subsidiary of 1MDB. 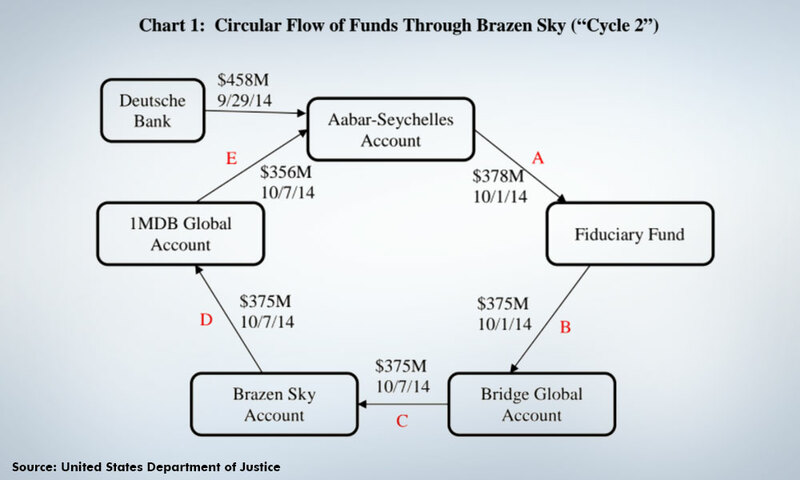 "The purpose of this unnecessarily complicated funds flow was to create the appearance that fund units in the Brazen Sky Account were being redeemed for cash and being paid forward to 1MDB, thereby fraudulently disguising the fact that the fund units were illiquid and relatively worthless," the DOJ said in its filing. On Sept 29, 2014, after Aabar-Seychelles received a second tranche totalling US$458 million from the US$975 million Deustche Bank loan, it repeated the same pattern by sending US$378 million to Lambasa which then passed US$375 million to Bridge Global which in turned allowed Brazen Sky to "redeem" the money. On Oct 7, 2014, Brazen Sky then sent US$375 million to 1MDB Global. However, this time, 1MDB Global sent US$356 million back to Aabar-Seychelles. This process was repeated for another five times. 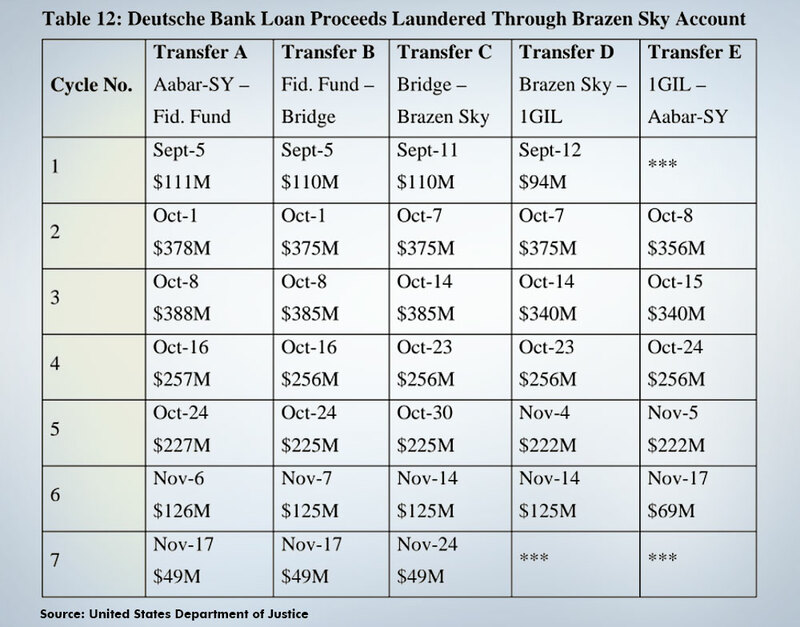 "By the end of November 2014, proceeds from the first tranche of the $975 million loan had passed through the Brazen Sky account once, and proceeds of the second tranche of the loan had passed through the Brazen Sky Account six times," said the DOJ. When this repetitive process was finally completed, it appeared as if Brazen Sky had redeemed US$1.412 billion from its "fund units". However, 1MDB faced a headache as the fraudulently valued Brazen Sky fund units were used as collateral for the Deutsche Bank Loan, which condition included that Brazen Sky cannot transfer its money out. However, in order to recycle the money, the conspirators had no choice but to breach the loan condition. The DOJ found that 1MDB's executive director of finance, described as "1MDB Officer 4", had faked documents to Deutsche Bank to convince them that no money had left Brazen Sky's account. 1MDB ultimately defaulted on the US$975 million loan, which was followed by Deutsche Bank's demanding an early repayment upon discovery of the deception in May 2015. IPIC later came in with a US$1 billion emergency loan to help 1MDB make the loan repayment but the white knight deal had since soured and turned into an arbitration case. Putrajaya had since sought for a settlement with IPIC and had, among others, agreed to repay the US$1 billion loan, with interest, in two tranches. Ironically, Putrajaya had indicated that 1MDB plans to repay part of the sum using the remaining of Brazen Sky's "fund units", which it claimed is worth US$940 million but its true value remains suspect. Apart from the Brazen Sky recycling, part of the US$975 million Deutsche Bank loan also benefitted Jho Low, Eric Tan Kim Long (Jho Low's alias) and another rogue Aabar executive Khadem Abdulla Al Qubaisi, totalling around US$29 million. The US$975 million Deutsche Bank loan had received a letter of support from Malaysian Official 1. "Internal Deutsche Bank records reflect that 1MDB officials opted to provide a Letter of Support signed by Malaysian Offical 1, rather than some form of guarantee by 1MDB, at least in part because a letter of support did not require Bank Negara or Cabinet approval. "At the request of 1MDB, all references to the Letter of Support were removed from the Facility Agreement," said the DOJ. Apart from the US$975 million loan, 1MDB also took out an earlier US$250 million loan from Deutsche Bank. The disbursement of that loan began on May 28, 2014 and by June 3, 2014, at least US$142 million ended up in Jho Low's personal bank accounts. Jho Low used the money to purchase a 300-foot luxury yacht. At least US$1,277,250 of this loan also found its way into the personal bank account of Malaysian Official 1 on June 18, 2014.